Louise, welcome to the Crime Lounge. Thank you so much for agreeing to answer a few questions! Let the fun begin! The most important thing is I’m a mum of 3 wonderful boys. I adore reading, cooking (actually more the eating part) and I’m possibly the worst piano player ever ‒ the instant I perch on my piano stool my dog and cat run away in horror, paws over their ears. So when I left school and I ended up in an office. In my 30’s I had a car accident which caused some damage to my spine and exacerbated a pre-existing hip condition. I was suddenly immobile, in chronic pain and clinically depressed. To cope with my new, enforced sedentary lifestyle, and to keep my mind off my self-pity (lying on the sofa all day watching Jeremy Kyle re-runs ‒ an all-time low), I started dabbling with a short story. It turned into The Sister, my debut novel. Too much! I love researching, discovering something new. My second book, The Gift, was based around cellular memory, the concept that a heart can retain memories of the donor when it’s transplanted. Jenna, my main character, becomes convinced Callie, her donor didn’t die in an accident but was murdered. It was fascinating speaking to doctors and transplant patients about their experiences and also what life after a transplant really is like ‒ often with many side-effects from anti-rejection medications. My research gave me so much scope. Was Jenna hallucinating or experiencing Callie’s memories? 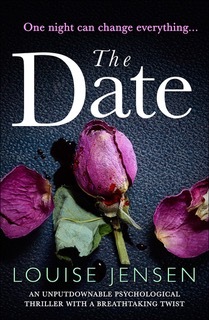 Researching Prospagnosia (Face Blindness) for my newly published fourth psychological thriller, The Date, brought me to Hannah Read who suffers the most severe case of Face Blindness in the UK. It’s been a real privilege to get to know her and also to raise awareness for this terrible condition for which there is no cure. I’m currently researching the decomposition of a body so that’s pretty gruesome, but I think the most interesting thing for me has been learning we can take one identical experience, i.e. a heart transplant, and everyone you speak to who has been through it has a completely different perspective. A different experience. We all have an interesting story to tell. After school drop-off and a dog walk I’m always at my desk by 9.00. Mornings are my creative time so that’s when I work on my manuscript. I find first drafts difficult and it’s hard to sustain my focus. After lunch, I blog, take part in interviews, do my accounts, social media, marketing, blog tours. I have twenty publishers now around the world and various release dates so there’s usually something to do promotion-wise. However, if I’m at the editing stage I can work all day – it’s absolutely my favourite part of the novel-writing process. Shaping the story into what it needs to be, developing characters, twisting the plot. I break at 5 to cook for my family but then I could be out in the evenings visiting book clubs and creative-writing groups and weekends might be literary festivals. Like most authors, my working hours are ridiculously long. Chronic pain can make it difficult to sit in one position and type for long periods. Also, it’s draining and I get tired quite quickly, which affects my concentration. Absolutely, meeting readers. I go to events whenever I can, whether I’m speaking or not and adore meeting people with a passion for stories. I grew up in a non-reading household and for years I thought there was something wrong with me because I became so engrossed in books. After being published I discovered, to my absolute joy, there is a world of people just like me. Hopefully my 5th psychological thriller will be out next year. It’s early days and I’m playing around with a different structure for me: a dual-narrative, past-tense story. I’m actually rereading Days of Wonder by Keith Stuart which blew me away when I read it on holiday earlier this year. I cried so much the manager of the hotel I was staying at came over and asked if I’d had bad news and if I needed a flight home! After that (and a period of recovery) I’m going to read Louise Beech’s The Lion Tamer Who Lost. I read The Lido last month by Libby Page and it was really uplifting. Our House by Louise Candlish has been one of my stand-out reads this year for something a little more tense. Although I love snakes, spiders and all forms of creepy crawlies I’m absolutely terrified of butterflies! I spend far too much time on Twitter, Facebook and Instagram – do come and say hello!